Well have I got another outfit of the week for you! At the beginning of the January sales, I found this black jumpsuit at Esprit… needless to say it was love at first sight! This jumpsuit is in a light fabric. It’s got three quarter sleeves, a drawstring at the waist and the legs (which are of course too long for me… story of my life!!!) can be rolled up which in my opinion works really well. The jumpsuit can be worn anyway you want… dressed up or down… I’ve already done both: I have worn this jumpsuit to the New Year’s party of my work (with my new silver pumps and a black choker it looked very elegant and chic). But I have also worn this jumpsuit to work with my long grey woollen cardigan, a leopard print scarf and ankle boots. For this shoot I themed the jumpsuit with my black ankle boots from Tamaris. Being wedges they are so comfortable! I literally can walk for hours in these boots… (hahaha… these boots are made for walking… Get it? Sorry… couldn’t resist this bad joke :-)). 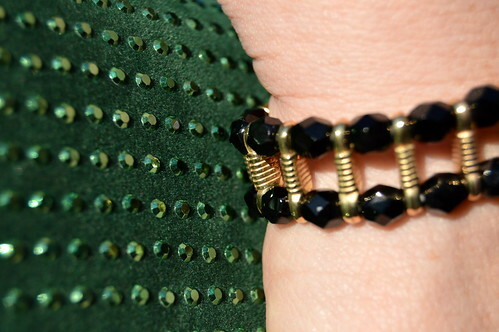 I’m wearing my long golden Other Stories earrings and a black and gold bracelet which is made by Claudia, the woman who does my nails… she’s so creative don’t you think! This jumpsuit is perfect for any occassion, any time of the year… that’s how I like my clothing! Comfortable, stylish, elegant, chic and oh so versatile… yip… I like it a lot! So what do you think of this outfit? Do you have a jumpsuit? Do tell! You can follow me on Instagram and Facebook! This entry was posted in Fashion, Outfits, Winter and tagged ankle boots, esprit, Fashion, jumpsuit, outfit, outfit of the week, tamaris.